Additional plenary talks were selected shortly before the conference on the basis of submitted abstracts. There was a special session of the conference dedicated to Ragnar-Olaf Buchweitz on the occasion of his 60th birthday. 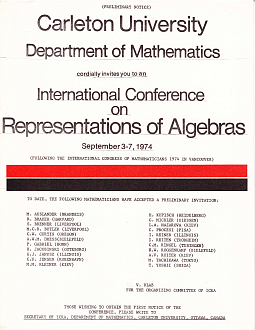 Another session was devoted to the development of computational methods in representation theory. The ICRA Award was awarded to Jan Stovicek during the conference. The members of the selection committee were W. Crawley-Boevey, B. Keller, H. Krause (Chair), I. Reiten, K. Yamagata. The meeting received generous support from the German Research Foundation (DFG) through the following grants: Collaborative Research Centre "Spectral Structures and Topological Methods in Mathematics" (SFB 701) and Priority Programme "Representation Theory" (SPP 1388). Additional support from the Westfälisch-Lippische Universitätsgesellschaft is gratefully acknowledged. See also here for more information.